More than half a century ago, a television show debuted that helped promote the cruise industry into the popular attraction it is today. Remember the name of that TV series? An interesting display area aboard the Regal Princess honors the show along with the November 2014 naming ceremony of the Regal Princess and its “Love Boat” connection. One of the photos shows a smiling Florence Henderson at the ceremony. The matriarch of “The Brady Bunch” and a favorite guest on the old “Love Boat,” Florence died in late 2016. The popular television show is credited with showing viewers how much fun a cruise can be and what a great vacation choice it is to book a journey on a modern cruise ship. “Love Boat” is said to be a major reason for the dramatic expansion of today’s cruise industry. And it all started more than 50 years ago on a Princess ship. The story goes that in the mid-70s, TV producer Douglas S. Cramer decided to film a series, not in a studio setting but aboard the beautiful environs of a modern cruise ship. Cramer found the ideal setting on a Princess cruise ship. Cramer teamed up with Aaron Spelling and the movie pilot was shot aboard the Sun Princess in Mexico. For 10 seasons, “The Love Boat” was one of the highest rated prime time television shows in the country. The show aired from 1977 to 1986. Later episodes and specials were filmed aboard many other Princess cruise ships in destinations around the globe. Before long, viewers began looking forward to seeing the big star of the show – a Princess cruise ship – and booking their own voyages. Today, Princess continues to be known as the “Love Boat” line. In fact, “Captain Stubing” (actor Gavin MacLeod) serves as the Princess Cruise company spokesman. 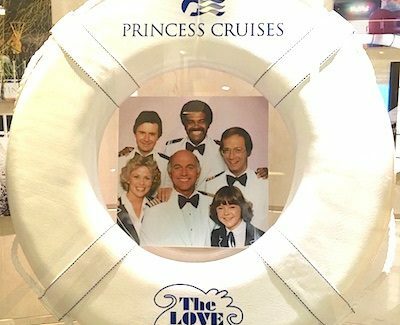 “People always ask us why ‘The Love Boat’ was so popular and I always say it’s because it gave people something to dream about,” Gavin MacLeod said in celebrating the 50-year partnership. The original “Love Boat” series is currently in worldwide syndication, having been translated into more than 29 different languages, and is viewed by millions of fans in more than 93 countries. Half a century after “Love Boat” first aired, Princess Cruises is the third largest cruise line in the world with a fleet of 18 cruise ships and a recognized leader in taking 1.7 million travelers each year to some of the most fascinating cruise destinations around the globe. For the Regal Princess christening in November 2014, all six of the original cast members served as the ship’s godparents and were joined by 25 of the show’s past guest stars. The photo display I saw on the Regal Princess celebrated that special day when the six Love Boat cast members – Gavin MacLeod (Captain Stubing), Fred Grandy (Gopher, the chief purser), Ted Lange (Isaac, the bartender), Bernie Kopell (Doc, the ship’s doctor), Lauren Tewes (cruise director, Julie) and Jill Whelan (Vicki, the captain’s daughter) – pulled a lever that first sent a record-breaking fifty champagne bottles smashing against the ship’s hull. That huge splash was a nod to the company’s anniversary celebration. It was followed by the breaking of a giant Nebuchadnezzar-size 51st bottle signifying Princess Cruises’ continued future success. Frequent show guest star Florence Henderson served as Master of Ceremonies for the special celebration. The photo display also has the bow and cork from that champagne send-off.